The Crack Binness vs. The Amway Bizness & The Delusion of Free Enterprise – A Nigerian – Canadian Renaissance Woman. The final meeting was short and not sweet. Heather’s mentor (I’ll call her Griselda) wanted to know what I thought of it all. 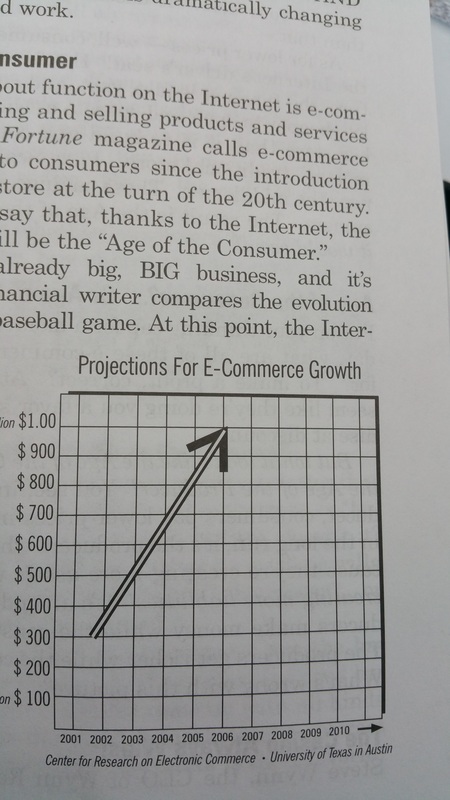 I said quite frankly that I did not see a business plan in their “bizness” plan…. Apparently, I was wrong. Of course it was a solid plan; I just had to see the overall vision of the Big Bizness! Griselda knew many people who had retired by 35 as millionaires; this was for a greater good too, to help other young women progress too. She was a charismatic young woman, warm and gentle…not pushy. She sounded sincere, even believed what she was selling. As she spoke, she mentioned often that it was not her job to convince me, the bizness was very simple. There was no need to complicate it with statistics, research or numbers. I simply had to consume $300/m; sell $150/m. I’d earn 35% in savings off personal use and 35% gross margins off sales. I just had to be open to it; see how I might fit in the ultimate goals. So, I asked for numbers; what would my overhead be? Undisclosed by Griselda but gathered from a friend who was actually suckered into this mess. 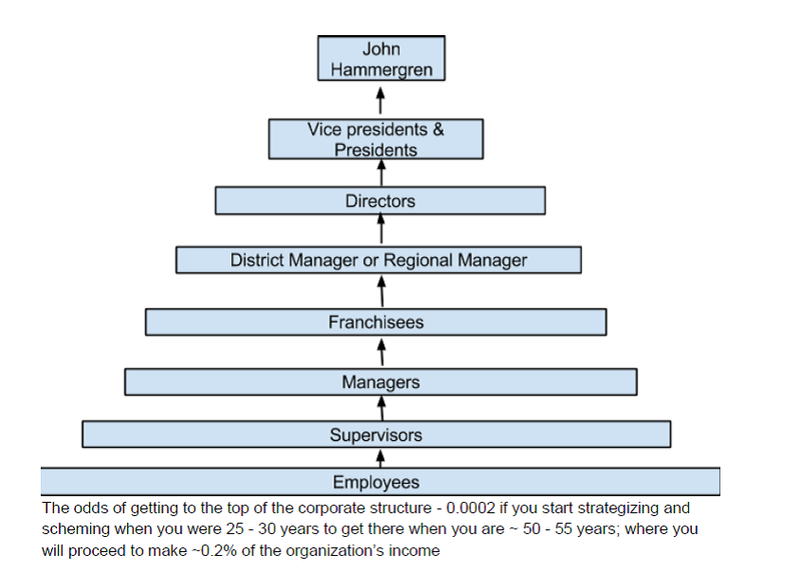 $25/m – Conference costs (paid as a one time expense ~ $300/ annum initially; this cost significantly increases as you rise up the Pyramid). There might be a little flaw in the “plan”. If you are consuming your purchase; you are not saving. The two things are mutually exclusive. Yes. All those TV commercials that claim you can save more by buying more lied to you. You save more when you do not buy more. Get it? When you buy what you need at the cheapest price you are being smart and spending less, but you are spending nonetheless. You are not making a profit by buying at a discount. Seems like stating the obvious right? To determinedly con people in the most spectacular multi level fashion imaginable. 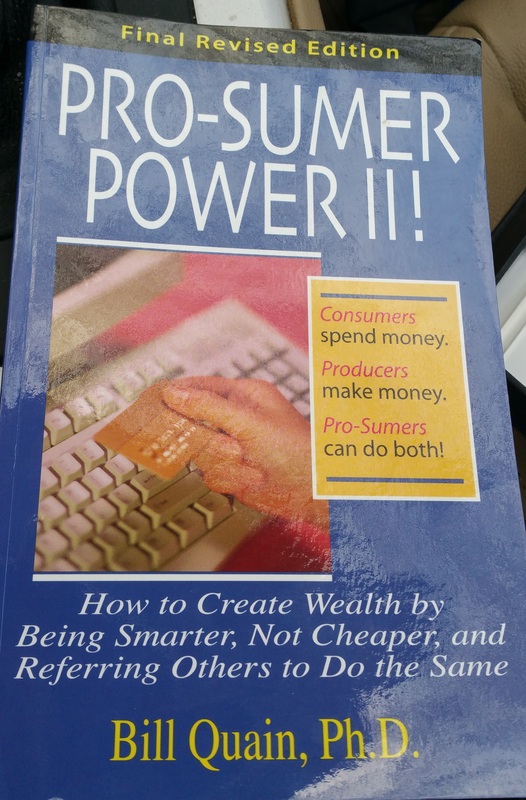 as in: Griselda amwayed Heather till the poor girl literally had thousands in noncash purchase savings and hundreds of thousands in consumed products. or as my Naija people will say: Ma Guy! That Griselda amwayed that Heather maga die! Amway products are seriously expensive. 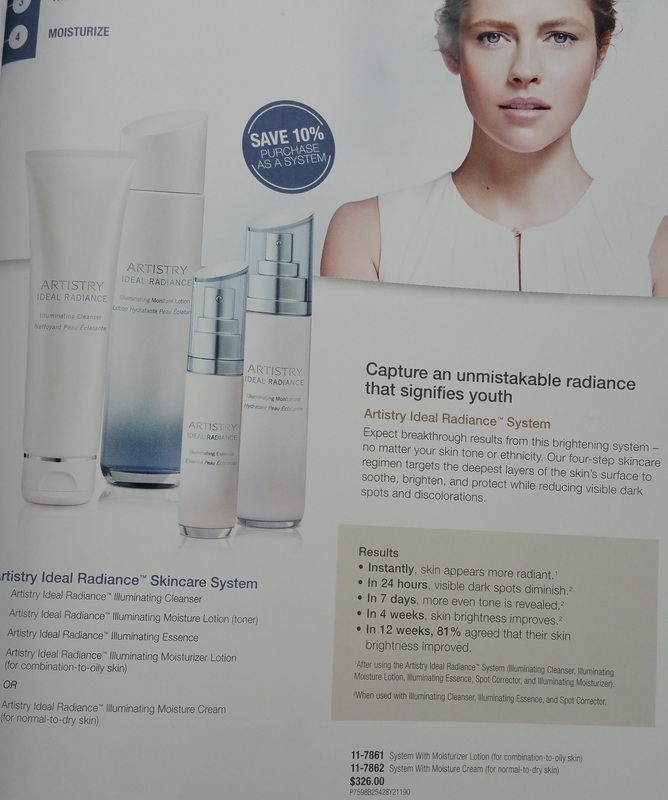 According to their brochures, you could spend anywhere between $200/m to $329/m on just facial products. Mint tells me that I spend only $8/ month on my face (cleanser, toner, night cream and lotion purchased in bulk every 3 – 6 months). 3. You never get high on your own supply! Griselda informed me that all business owners need to support their own business by buying more from themselves; you “earn” 35% in savings and help everyone in your network…Sigh. 3.3 million people bought this line? Really? Imagine if each Starbucks owner drank 7 out of every 10 coffees sold to support their business as well as everyone in their corporate office. Working 32 hours per week only to lose -$431.48 per month in the quest to gain freedom from your oppressive time consuming job is probably not the most PhD- like decision one can make. …You know that feeling that there is a Starbucks everywhere? Well, we have 72 in Edmonton, 65 Shoppers Drug Mart locations, 5 Walmart locations …. 4,000 Amway distributors in Edmonton. Imagine 4000 Walmart locations in Edmonton or 4000 Shoppers Drug Mart locations or 50 times more Starbucks locations. Who is buying if almost everyone is selling??? The odds of getting to the top of this structure (or climbing 6 levels) — 0.00000067 if you do not die or get incarcerated (hopefully someone finally wins a court case against this bunch, because it is crazy that this is legal); where you will proceed to make <0.36% of the organization’s income. 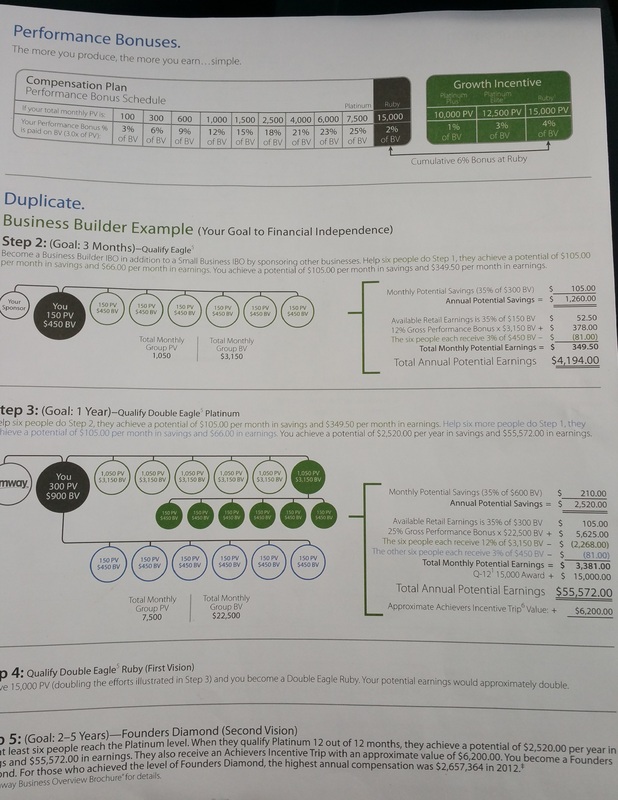 Deduced from the fine print of the brochures: 5 in 1000 distributors make $55,000 a year; 1 in 10000 make $111,000 a year; 6 in 100000 make up to $2,657,000 a year….Not exactly a sure bet! So, if one was lucky enough not to get shot or incarcerated, one has a significantly (>30000 times) better chance at financial freedom dealing crack than by joining Amway. DISCLAIMER: I do not in anyway endorse or support dealing crack! Just pointing out how ludicrously bad an idea this Amway madness is. I met with the Amway bizness women … later than initially planned, because at some point before hand, I decided to launch a store for my crafts (Side note: Please visit the Crafters Store at 4805 50 Ave, Leduc for some beautiful things from me! )… an actual business! Needless to say, to the obvious frustration of Heather, I did not buy into this bizness. She made sure I was aware of how risky my current career choices were, and how I was not actively mentoring young women or leading a big network as I might want. Griselda made sure I was aware that not everyone was rich enough to invest and the Amway way was a tried and true model to escape quickly into financial freedom. Well I was definitely not rich enough to invest…in fact if anyone had odds stacked against them it was me: 15 year old, traveler – now immigrant, living completely independent of family by 19, with that beautiful accent (perceived as a language barrier by most), ignorant of politics, biases, stereotypes & systems, without savings, unable to work off campus & denied access to loans (as an international student), required to pay more on down payments (on work permit status)… and more obstacles than I care to think of. If I could save enough to invest and figure out the system without manipulating poor people into a massively exploitative bizness, then in my opinion Griselda, Heather and Bill could to…It has absolutely nothing to do with having a large enough amount of money to start off. “Nothing in all the world is more dangerous than sincere ignorance and conscientious stupidity.” Martin Luther King Junior. *Oga – A Yoruba word for Boss. Posted on June 1, 2015 June 14, 2015 by MorenikePosted in EntrepreneurshipTagged Alberta, Amway, business, canada, edmonton, independent business owner, kiyosaki, Leaders, mentors, multi level marketing, network marketing, passive income, world wide dream builders.